Sean Golder is the Regional Operations Manager for all 12 community health centers in north Florida’s PanCare Health network, but he talks about all of the patients served by his centers as if they’re his own. We met in a town called Marianna, in Jackson County, a region that was devastated by Hurricane Michael. International Medical Corps was there to provide temporary shelters, equipment and supplies to two PanCare Health centers—one in Marianna, one in Panama City—so they can continue to serve patients until their buildings are fully restored, a process that should take about six months. The centers each typically serve some 30 to 50 people per day, 80% of whom are on Medicare or Medicaid, or completely uninsured. Without the centers, they would have few, if any, alternatives for care. 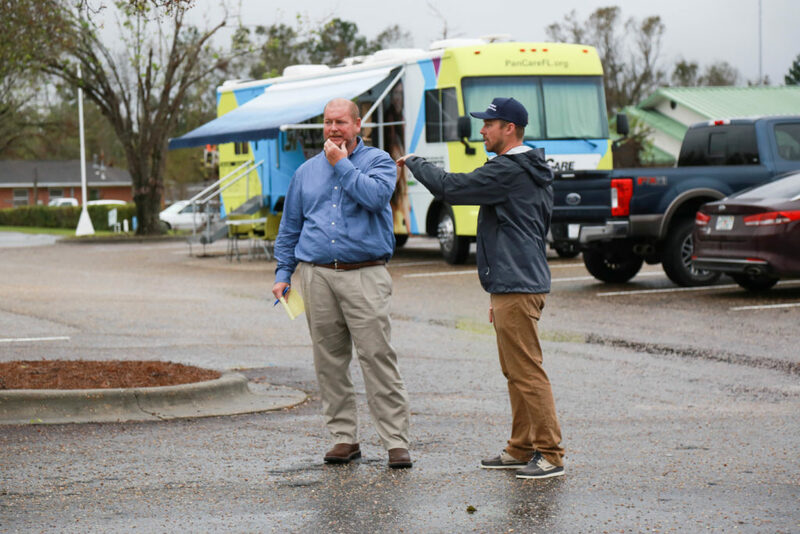 PanCare’s Sean Golder (left) and International Medical Corps’ Trevor Rhodes inspect the parking lot where an International Medical Corps team set up a temporary health center in Marianna, Florida. As so often happens with local first responders during a disaster, Golder is not just providing care—he’s also personally affected, living by himself in a trailer on his property while his family stays with relatives until the storm damage that rendered their home uninhabitable is repaired. 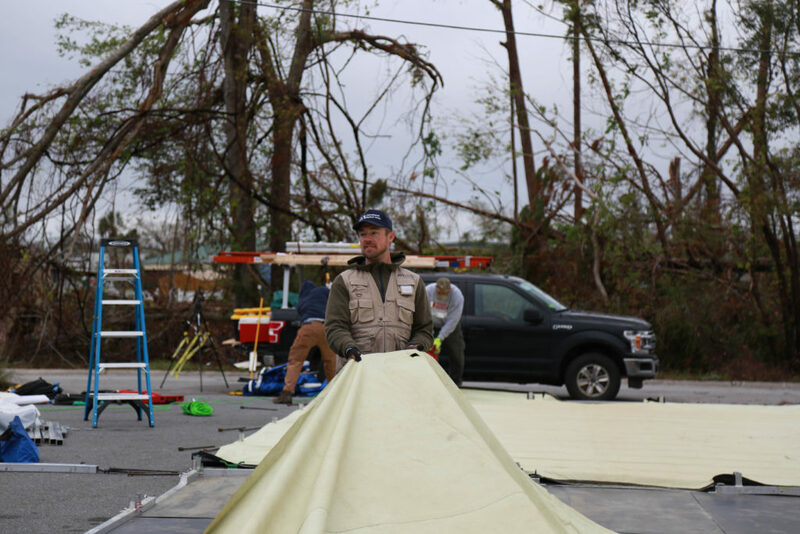 Emergency Specialist Trevor Rhodes helped to lead the International Medical Corps response to Hurricane Michael, including our initiative to provide temporary shelters for PanCare and its patients. Hurricane Michael tore through the community with brute force, snapping entire groves of trees, and destroying homes, businesses and property. 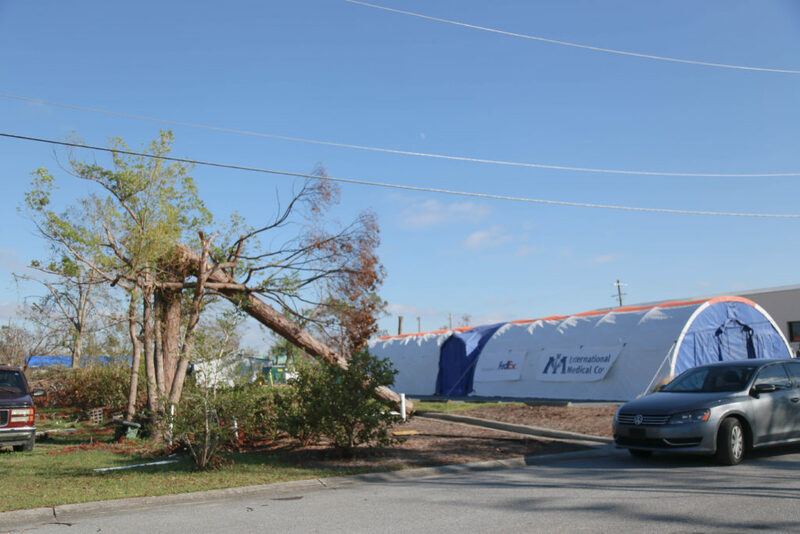 Despite extensive damage, the Marianna health center began providing limited medical and dental care within a week of the storm, in two mobile units. The shelters provided by International Medical Corps—with the support of FedEx and the AbbVie Foundation—have enabled PanCare Health to again provide patients with a full range of services. Golder proudly explains that the Marianna facility is the only community health center in Jackson County that provides the exact same level of care for uninsured patients, at a sliding scale, that folks with top-tier private insurance receive. More than a month after the storm, a lot of smaller providers, such as family clinics and sole practitioners, still haven’t re-opened—and they may not, Golder says. He estimates that at least 30% of the population hasn’t returned after they were displaced by the devastating effects of the hurricane. So going to their regular healthcare provider, or even contacting their provider to have them call in a prescription refill, is not possible for many people here. Portable shelters arrive in shipping containers and can be assembled into a medical facility by a skilled team within hours. As he goes on, I can see the emotion beneath the surface of his strong demeanor. “You’ve got a lot of folks who are just trying to decide what they’re going to do. North Florida is not a metropolitan stronghold like Jacksonville, Tampa, Miami; we have a higher percentage of family-owned businesses. A lot of us grew up here and have been here all our lives, and we never thought anything like this was going to happen. So, it’s tough. A lot of people are having to make some really hard decisions,” he explains. I’m amazed when Kelley tells me that she’s seen people weeping with gratitude at PanCare’s mobile medical and dental centers, where they’ve come to seek care. “They’re so stressed out about everything. Their house is gone, their car is gone…I had a lady whose cat died during the storm and she’s just crying. Even if you’re just going for a dental cleaning, it’s a little bit of normalcy,” she explains. “A lot of people lost their jobs. They have no money, and so they can’t afford to go pay a doctor right now or pay a dentist right now. So us just being here to help in any little way that we can, it’s just the most rewarding thing.” And keeping her focus on helping others, Kelley says, helps keep her mind off of the hardships that her own family faces in recovering from the storm. 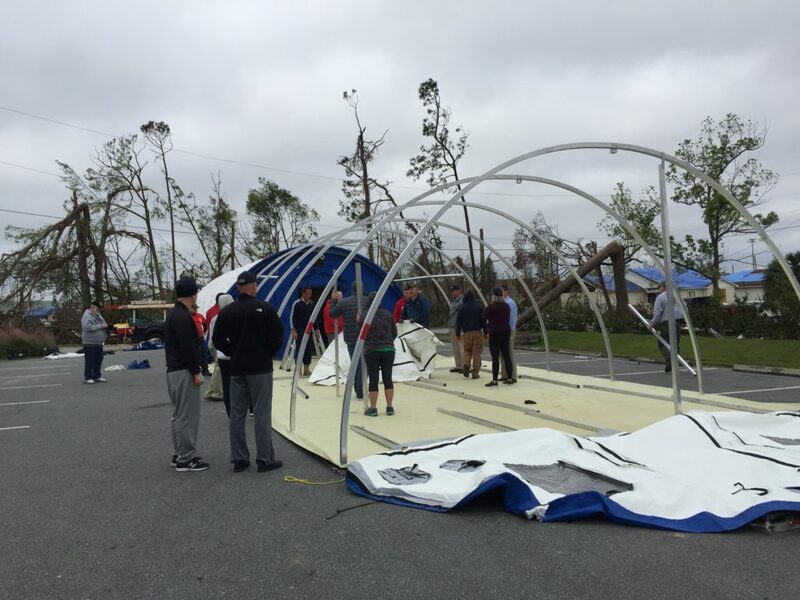 This temporary health center was set up in the parking lot of PanCare’s Panama City location, where evidence of the powerful Category 4 storm is still evident. Despite obstacles and unknowns, despite challenges that at times seem like they could be overwhelming, there’s one thing that both Golder and Kelley are very certain about: their health centers aren’t going anywhere. They know that too many people in their community depend on them, and—with the help of International Medical Corps, FedEx and AbbVie—they’re going to continue doing everything they can to take care of each one of them.